Our most popular flavors, all in one place! You'll get two cheesecakes, shipped in one box! Strawberry Cheesecake & Original Sampler. Each cake is pre-cut. 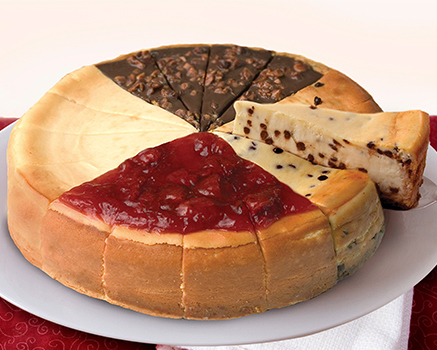 Original Sampler includes four slices each of our Original Plain, Strawberry, Chocolate Chip and Candy Bar Cheesecakes. Eli's Desserts are perishable and shipped frozen, packaged with dry ice in a heavy-duty Styrofoam container so each arrives picture perfect. STANDARD SERVICE: Orders placed Sunday through Wednesday by 11:00 am Central Time will be delivered the same week. Orders placed Wednesday 11:01am through Saturday midnight will be delivered the following week. Product is shipped in the continental United States. Shipping cost is $29.95. Please call for delivery and service to Hawaii and Alaska (800) ELI-CAKE. PRIORITY DELIVERY: Orders received by 11:00 am Central Time will be delivered in one business day for $43.95. Thaw Eli's Cheesecakes overnight in the refrigerator or at room temperature for up to 2 hours. Once thawed, store in the refrigerator for up to 5 days. To serve, remove thawed dessert from box and remove shrink wrap and collar, if applicable. Remove the papers from each slice before serving. Frozen: Elis Cheesecakes can be stored frozen at zero degrees (0F) for up to 9 months, tightly wrapped.Refrigerated: Once thawed, Elis Cheesecakes can be stored covered up to 5 days in the refrigerator. Ingredients: Cream Cheese (Pasteurized Milk and Cream, Cheese Culture, Salt, Carob Bean Gum, Guar Gum), Sugar, Sour Cream (Cultured Nonfat Milk and Cream, Corn Starch, Whey, Guar Gum, Carrageenan, Carob Bean Gum, Enzymes), Egg, Wheat Flour, Butter (Cream, Salt), Powdered Sugar (Sugar, Corn Starch), Modified Corn Starch, Vanilla Extract, Egg Whites, Salt, Soy Lecithin. No Artificial Trans Fat. Any trans fat in this product is naturally occurring in the pure dairy products we use, such as milk, butter and cream cheese. Ingredients: Cream Cheese (Pasteurized Milk and Cream, Cheese Culture, Salt, Carob Bean Gum, Guar Gum), Strawberry Topping (Strawberries, Sugar, Water, Modified Corn Starch, Corn Syrup, Cultured Dextrose, Calcium Chloride, Citric Acid, Natural Flavor, Carrot and Black Currant Juice (Colors), Carrageenan, Xanthan Gum and Cellulose Gum), Sugar, Sour Cream (Cultured Nonfat Milk and Cream, Corn Starch, Whey, Guar Gum, Carrageenan, Carob Bean Gum, Enzymes), Egg, Wheat Flour, Butter (Cream, Salt), Powdered Sugar (Sugar, Corn Starch), Modified Corn Starch, Vanilla Extract, Egg Whites, Salt, Soy Lecithin. Ingredients: Cream Cheese (Pasteurized Milk and Cream, Cheese Culture, Salt, Carob Bean Gum, Guar Gum), Sugar, Sour Cream (Cultured Nonfat Milk and Cream, Cornstarch, Whey Protein Concentrate, Guar Gum, Carrageenan, Carob Bean Gum, Enzymes), Bittersweet Chocolate Chips (Sugar, Chocolate Liquor, Cocoa Butter, Butterfat, Vanilla, Soy Lecithin and Salt), Whole Egg, Wheat Flour, Butter (Cream, Salt), Powdered Sugar, Modified Corn Starch, Cocoa (Processed with Alkali), Egg Whites, Salt. Ingredients: Cream Cheese (Pasteurized Milk and Cream, Cheese Culture, Salt, Carob Bean Gum, Guar Gum), Sugar, Sour Cream (Cultured Nonfat Milk and Cream, Cornstarch, Whey Protein Concentrate, Guar Gum, Carrageenan, Carob Bean Gum, Enzymes), Heath Toffee Bar Pieces [Milk Chocolate (Sugar, Cocoa Butter, Chocolate, Nonfat Milk, Milkfat, Lactose, Soy Lecithin, Salt, Vanillin), Sugar, Palm Oil, Butter, Roasted Almonds, Salt, Artificial Flavor and Soy Lecithin], Milk Chocolate Chips (Sugar, Chocolate Liquor, Milk Powder, Cocoa Butter, Soy Lecithin (Emulsifier), Vanillin), Egg, Wheat Flour, Butter (Cream, Salt), Roasted Almonds, Powdered Sugar, Milk Chocolate [Coconut Oil, Sugar, Whole Milk, Chocolate Liquor, Cocoa Butter, Soy Lecithin (Emulsifier) and Vanillin], Heavy Cream (Cream, Carrageenan), Cocoa (Processed with Alkali), Evaporated Milk (Milk, Dipotassium Phosphate, Carrageenan and Vitamin D), Egg Whites, Natural Flavor (Natural Flavoring, Propylene Glycol, Glycerin), Salt, Caramel (Color), Stabilizer (Gum Acacia, Propylene Glycol Alginate, Xanthan Gum). Allergens: CONTAINS: Wheat, Milk, Egg, Soy and Tree Nuts (Almond) Allergens. ALLERGEN WARNING: MAY CONTAIN Peanut and other Tree Nut Allergens.